My kitchen is a very happy place right now. After summer, fall is my favorite season for cooking. Autumn vegetables, fruits, and spices are among my favorite things to cook with. The warm flavors speak of home and comfort to me. Because I love these flavors I tend to overbuy fresh fall produce when it hits the stores. What can I say – I’m greedy! In this case I had too many sweet potatoes. What I came up with is all my favorite cool weather flavors in a soft, cake like, cookie. It also saved me from wasting food. It is all good! 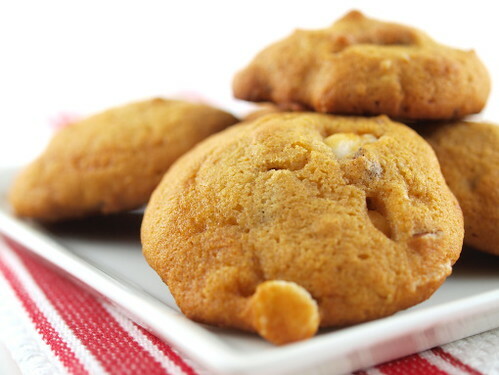 If you like soft, tender cookies then these are for you! Balance is the key to this cookie. 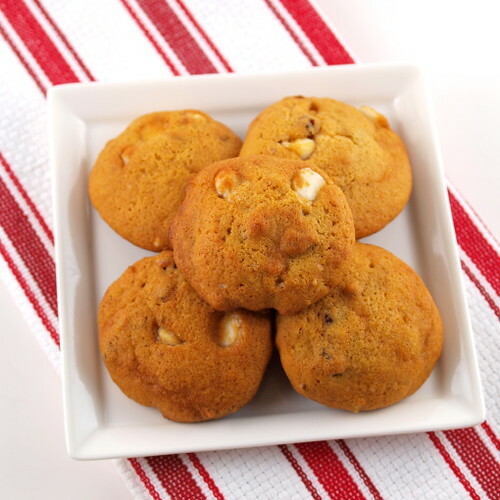 A golden brown exterior houses a fluffy interior spiked with toasty pecans, tangy cranberries, and buttery white chocolate. 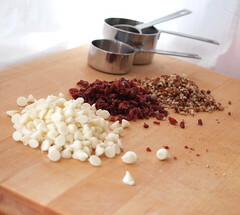 No one flavor is stronger than any other, so while you can taste the individual components the overall flavor is subtle, slightly spicy, and rich. 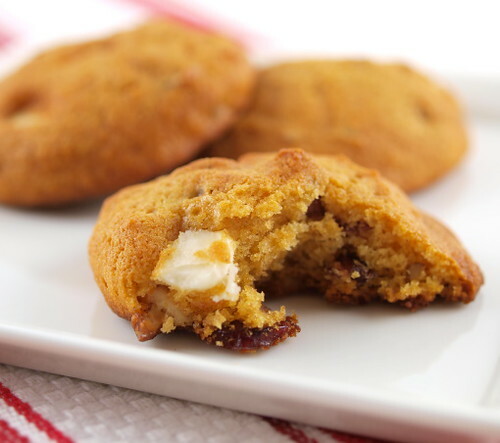 Want a fancy cookie to serve for dessert? Top them with a drizzle of orange glaze. 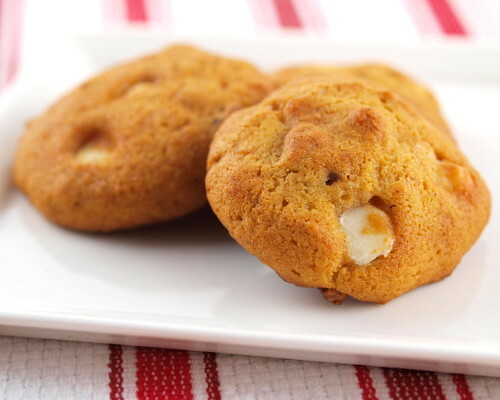 These would be great if you wanted to make whoopie pies with them, maybe with a rum or bourbon flavored filling. It’s just a thought. 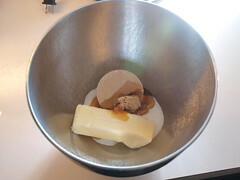 In a medium bowl cream together the butter, both sugars, and golden syrup or honey until light and fluffy. 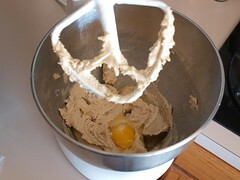 Add the egg and vanilla and blend on medium speed until well mixed and fluffy. 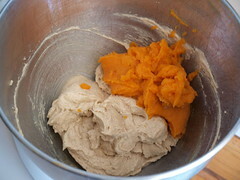 Add the sweet potato and mix well. 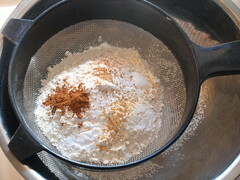 In a separate bowl sift together the flour, baking powder, baking soda, salt, and spices. 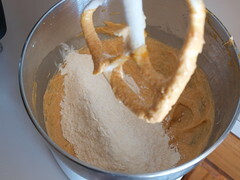 Add the sifted dry ingredients into the sweet potato mixture and blend until the dry mixture is just moistened. 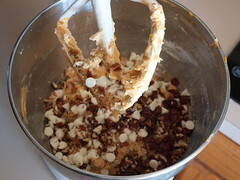 Fold in the white chocolate chips, chopped pecans, and cranberries until evenly distributed. 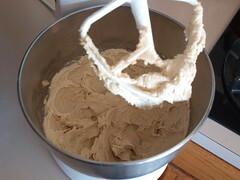 Scoop the dough into the prepared sheet pans by rounded tablespoons. 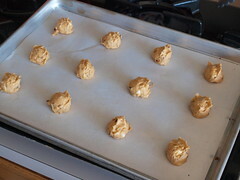 Bake for 8-10 minutes, or until the cookies are puffed and golden. 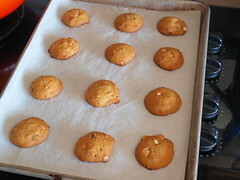 Cool on the pan for five minutes then transfer to a wire rack to cool.